Hello dear friends!! Today I have some shabby chic goodness to share with you using one one of my favorite Glitz papers of all time, the red polka dot from the Love Nest line. In the first card, I paired the Love Nest Red Polka with Afternoon Muse Floral paper and I totally love the look!! 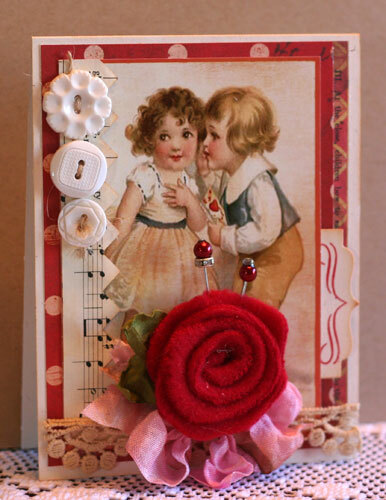 I stitched two small strips of the polka on either side of the floral and attached them to a Rustic Cream card base. I inked all the edges liberally and added several elements to give it a shabby chic feel. 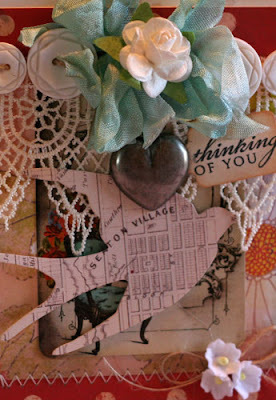 Other supplies: 7 Gypsies Paris Dangle Charms; Papertrey Ink Rustic Cream cardstock; Prima Rose; Florals from my stash; Papertrey Ink Button Twine; Papertrey Ink Buttons, Hand Died Seam Binding: MemrieMare; Lace from my stash; Papertrey Ink Tiny Tags Die; Papertrey Ink Little Labels Stamps. The next card is a quick and easy card using the Love Nest Polka Paper and a Laced with Grace whatnot as the focal point. 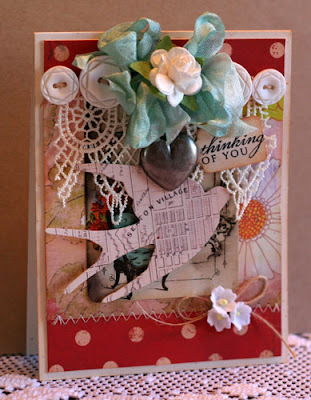 I added several layers of different papers, some lace, buttons and a beautiful felt rose to enhance the Shabby Chic beauty of the sweet little Whatnot. 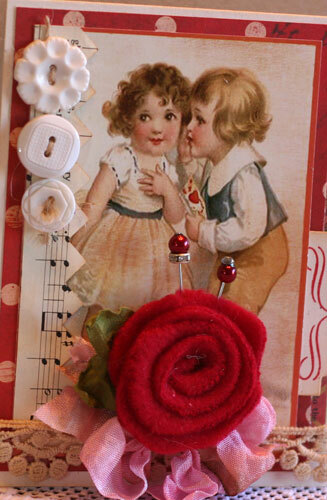 Other Supplies: Papertrey Ink Rustic Cream Cardstock and Buttons; Vintage Hymnal Paper; Prima Lace; Papertrey Ink Half and Half die and stamps; Papertrey Ink Banner Border Die; Felt Rose and Pins from my stash!! Wishing you a very Glitzy Day! !